For the state, see Republic of Zakopane. Zakopane is a town in the extreme south of Poland, in the southern part of the Podhale region at the foot of the Tatra Mountains. From 1975 to 1998 it was part of Nowy Sącz Province; since 1999 it has been part of Lesser Poland Province. As of 2017[update] its population was 27,266. Zakopane is a center of Goral culture and is often referred to as "the winter capital of Poland”. It is a popular destination for mountaineering, skiing, and tourism. Zakopane lies near Poland's border with Slovakia, in a valley between the Tatra Mountains and Gubałówka Hill. It can be reached by train or bus from the province capital, Kraków, about two hours away. Zakopane lies 800–1,000 meters above sea level and centers on the intersection of its Krupówki and Kościuszko Streets. The earliest documents mentioning Zakopane date to the 17th century, describing a glade called Zakopisko. In 1676 it was a village of 43 inhabitants. 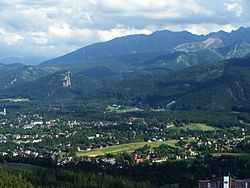 In 1818 Zakopane was a small town that was still being developed. There were only 340 homes that held 445 families. The population of Zakopane at that time was 1,805. 934 women and 871 men lived in Zakopane. The first church was built in 1847, by Józef Stolarczyk. Zakopane became a center for the region's mining and metallurgy industries; in the 19th century, it was the largest center for metallurgy in Galicia. It expanded during the 19th century as the climate attracted more inhabitants. By 1889 it had developed from a small village into a climatic health resort. Rail service to Zakopane began October 1, 1899. In the late 1800s Zakopane constructed a road that went to the town of Nowy Targ, and railways that came from Chabówka. Because of easier transportation the population of Zakopane had increased to about 3,000 people by the end of the 1900s. In the 19th century, the Krupówki street was just a narrow beaten path that was meant for people to get from the central part of town to Kuźnice. The ski jump on Wielka Krokiew was opened in 1925. The cable car to Kasprowy Wierch was completed in 1936. The funicular connected Zakopane and the top of Gubałówka in 1938. Because of Zakopane's popular ski mountains, the town gained popularity this made the number of tourists increase to about 60,000 people by 1930. In March 1940, representatives of the Soviet NKVD and the Nazi Gestapo met for one week in Zakopane's Villa Tadeusz, to coordinate the pacification of resistance in Poland. Throughout World War II, Zakopane served as an underground staging point between Poland and Hungary. From 1942 to 1943, 1,000 prisoners from the German Kraków-Płaszów concentration camp were set to work in a stone quarry. The Zakopane Style of Architecture is an architectural mode inspired by the regional art of Poland’s highland region known as Podhale. Drawing on the motifs and traditions in the buildings of the Carpathian Mountains, the style was pioneered by Stanislaw Witkiewicz and is now considered a core tradition of the Goral people. The Tatras are a popular destination among hikers, skiers, ski-tourers and climbers. There is a network of well marked hiking trails in the Tatras and according to the national park regulations the hikers must stick to them. Most of these trails are overcrowded, especially in the summer season. The High Tatras offer excellent opportunities for climbing (up to X UIAA grade). In summer, lightning and snow are both potential hazards for climbers, and the weather can change quickly. Thunderstorms are common in the afternoons. In winter the snow can be up to several meters deep. In the winter, thousands arrive in Zakopane to ski, especially around Christmas and in February. The most popular skiing areas are Kasprowy Wierch and Gubałówka. There are a number of cross country skiing trails in the forests surrounding the town. Zakopane hosted the Nordic World Ski Championships in 1929, 1939, and 1962; the winter Universiades in 1956, 1993, and 2001; the biathlon World Championship; several ski jumping world cups; and several Nordic combined, Nordic and Alpine European Cups. It hosted the Alpine World Ski Championships in 1939, the first outside the Alps and the last official world championships prior to World War II. Zakopane made unsuccessful bids to host the 2006 Winter Olympics and the 2011 and 2013 Alpine World Ski Championships. Zakopane is visited by over 2,500,000 tourists a year. In the winter, Zakopanes tourists are interested in winter sports activities such as skiing, snowboarding, ski jumping, snowmobiling, sleigh rides, snowshoe walks, and Ice skating. During the summer, Tourists come to do activities like hiking, climbing, bike and horse ride the Tatras mountain, there are many trails in the Tatras. Tourists ride quads and dirt bikes that you can rent. Swimming and boat rides on the Dunajec river is popular. Many come to experience Goral culture, which is rich in its unique styles of food, speech, architecture, music, and costume. Zakopane is especially popular during the winter holidays, which are celebrated in traditional style, with dances, decorated horse-pulled sleighs called kuligs and roast lamb. A popular tourist activity is taking a stroll through the town's most popular street: Krupówki. It is lined with stores, restaurants, carnival rides, and performers. During the winter and summer seasons, Krupówki Street is crowded with tourists visiting the shops and restaurants. In the summer, a local market along Krupówki Street offers traditional Goral apparel, leather jackets, fur coats, shoes, and purses. Venders also sell foods like the famous oscypek smoked sheep cheese, fruit, vegetables, and meats. There are also many stands with Zakopane souvenirs. Zakopane is popular for night life. At night there are always people walking around town checking out the different bars and dance clubs. Most of these bars and dance clubs are located on the Krupowki street. These are the bars that are located in Zakopane: Paparazzi, Cafe Piano, Anemone, Anemone, Cafe Antrakt, Literatka, Winoteka Pod Berlami, and Karczma u Ratownikow. These are dance clubs located in Zakopane: Vavaboom, Finlandia Arctic, Genesis, Rockus, Morskie Oko, and Cocomo Go Go Club. A scene in Andrzej Wajda's film Man of Marble (Człowiek z marmuru) was filmed in Zakopane, introducing the town to a worldwide audience. The mountain scenes from the Bollywood film Fanaa were filmed around Zakopane. Zakopane participates in town twinning to foster international links. Mariusz Zaruski, (1867–1941) Polish Brigadier-General, a pioneer of Polish sports yachting, a climber of the Tatra Mountains, a photographer, painter, poet and writer, a seamen and traveler, a conspirator and a devoted social activist, sportsman and teacher. Stanisław Ignacy Witkiewicz (1885 – 1939), Witkacy, Polish writer, painter, philosopher, playwright, novelist, and photographer. Anna Zofia Krygowska (1904–1988) Polish mathematician, known for her work in mathematics education. Stanisław Marusarz (1913 in Zakopane – 1993 in Zakopane) Polish Nordic skiing competitor in the 1930s. Małgorzata Babiarz, (born 1984 in Zakopane) professionally known as Megitza is a singer, double bass player and composer. Kamil Stoch, (born 1987 in Zakopane) Polish ski jumper, world champion and three times Olympic gold medalist. ^ a b GUS. "Powierzchnia i ludność w przekroju terytorialnym w 2017 r." stat.gov.pl. Retrieved 10 April 2019. ^ "Zakopane - What To See in Poland's Winter Capital". Adventurous Travels - Adventure Travel - Best Beaches - Off the Beaten Path - Best Countries - Best Mountains Treks. Retrieved 10 April 2019. ^ a b c d e "Local history - Information about the town - Zakopane - Virtual Shtetl". www.sztetl.org.pl (in Polish). Retrieved 2017-05-04. ^ "Zakopane Style Museum Zakopane | Poland". Zakopane Life. Retrieved 2011-06-03. ^ "The Tatra Museum - The Museum of the Zakopane Style". Muzeumtatrzanskie.com.pl. Retrieved 2011-06-03. ^ "Seattle Times - Scenic Zakopane". Retrieved 10 April 2019. ^ a b c d e f altius. "Things to do in Zakopane and Tatra Mountains". www.discoverzakopane.com. Retrieved 2017-05-04. ^ Monika Piątkowska, Prus: Śledztwo biograficzne (Prus: A Biographical Investigation), Kraków, Wydawnictwo Znak, 2017, ISBN 978-83-240-4543-3, p. 327. ^ Krystyna Tokarzówna and Stanisław Fita, Bolesław Prus, 1847–1912: Kalendarz życia i twórczości (Bolesław Prus, 1847–1912: A Calendar of His Life and Work), edited by Zygmunt Szweykowski, Warsaw, Państwowy Instytut Wydawniczy, 1969, pp. 232, 235, et passim. ^ a b c Zdzisław Najder, Joseph Conrad: A Life, translated by Halina Najder, Rochester, New York, Camden House, 2007, ISBN 1-57113-347-X, pp. 458–63. ^ a b Zdzisław Najder, Joseph Conrad: A Life, translated by Halina Najder, Rochester, New York, Camden House, 2007, ISBN 1-57113-347-X, pp. 463–64. ^ Mateusiak, Tomasz (9 March 2011). "Zakopane: Maria Skłodowska Cure kochała Podhale". zakopane.naszemiasto.pl. Retrieved 10 April 2019. ^ 1878-1957., Döblin, Alfred, (1991). Journey to Poland. Neugroschel, Joachim., Graber, Heinz., Mazal Holocaust Collection. (1st American ed.). New York: Paragon House Publishers. pp. 211–227. ISBN 1557782679. OCLC 21950967. ^ Zdzisław Najder, Joseph Conrad: A Life, translated by Halina Najder, Rochester, New York, Camden House, 2007, ISBN 1-57113-347-X, p. 463. ^ Waclaw Szybalski, "The genius of Rudolf Stefan Weigl (1883 – 1957), a Lvovian microbe hunter and breeder": in memoriam, McArdle Laboratory for Cancer Research, University of Wisconsin, Madison, WI 53705, USA. ^ Madeleine Masson, Christine: A Search for Christine Granville, G.M., O.B.E., Croix de Guerre, with a Foreword by Francis Cammaerts, D.S.O., Légion d'Honneur, Croix de Guerre, U.S. Medal of Freedom, London, Hamish Hamilton, 1975, p. 24. Stanisław Kasztelowicz and Stanisław Eile, Stefan Żeromski: kalendarz życia i twórczości (Stefan Żeromski: A Calendar of His Life and Work), Kraków, Wydawnictwo Literackie, 1961. Krystyna Tokarzówna and Stanisław Fita, Bolesław Prus, 1847–1912: Kalendarz życia i twórczości (Bolesław Prus, 1847–1912: A Calendar of His Life and Work), edited by Zygmunt Szweykowski, Warsaw, Państwowy Instytut Wydawniczy, 1969. Wikivoyage has a travel guide for Zakopane. Wikimedia Commons has media related to Zakopane.